Listening to music is relaxing, especially when driving. But it’s stressful trying to listen to music in a noisy car environment. As your car moves along the road, the roaring engine noise, road noise and noise from other cars can destroy your listening experience. Also, panels in most cars tend to vibrate or resonate, thereby ruining the beats from your car audio system. Thus, what can you do to reduce such external noise? While some cars come with some sound damping, it’s not that effective. A lot of noise can still find its way into your car. The best solution is soundproofing your car by installing an effective sound deadener. 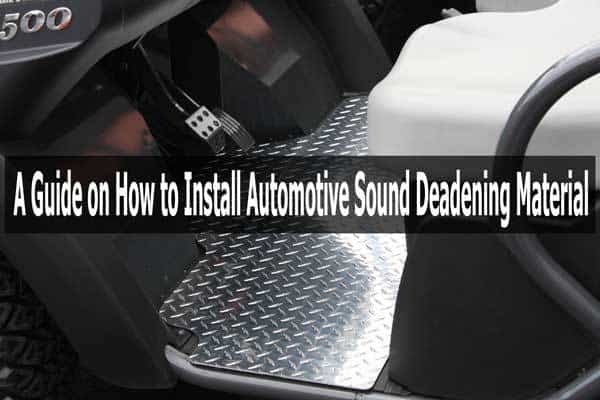 Read on through this guide on how to install automotive sound deadening material and get the best listening experience in your car. Which Type of Sound Deadener Should I Install? There’re many types and brands of sound dampening materials. Some noise deadeners are a form of foam padding while others are reflective insulators and sprays. Some come in form of mats while others come as sheets or panels. Different types of noise deadeners are suitable for different parts of a car. For instance, mats are best suitable for the floor while foam insulation sheets are ideal for the doors. The brand to choose should depend on where you want to soundproof, its size, effectiveness, and budget. Nevertheless, it’s best choosing a combination of different materials for the best results. Insulation- This material is basically made of fibers. It comes as a thick panel designed to absorb noise. Besides absorbing noise, insulation materials also insulate your car against heat by reflecting unwanted heat. Insulation panels are ideal for insulating the roof and doors. Mats- Mats are designed to soundproof car panels, especially the floor and doors. Some mats tend to be bulky, that’s why they’re preferred for dampening the floor. They work by reducing resonance or converting vibrations into heat. Foam- Foam comes as a spray or a sheet. Foam is often lightweight and great for doors. Those that come as sheets are simply laid over a panel and work by absorbing vibrations. Those that come as a spray are applied using a compressor can. Sprays- While mats and insulation are great noise dampening materials, they’re not ideal for some areas of the car. For instance, some areas are too tiny or hidden to fit a mat. In such areas, it’s ideal to use sprays since they can penetrate even the tiniest areas. Also, sprays are ideal for areas where you wouldn’t want to add much weight like on the door panels. As you can see, these materials are different in design and work differently. However, they all serve the same purpose of reducing noise. Which Areas Will I Soundproof? Basically, the areas to soundproof include the doors, floor, trunk, roof, rear deck, and firewall. The doors need to be dampened to reduce wind noise, vibrations and mechanical rattles. The floor requires dampening to reduce road noise, heat and drive train. The roof needs to be insulated against heat and wind noise. Also, the rear deck needs soundproofing against mechanical rattling and vibrations. Don’t forget to cover the firewall to reduce road noise, engine noise, and insulation against heat. Also, feel free to apply a deadener on any other car area you would want. Before starting the installation process, it’s good to ask yourself how much sound deadening your car needs. Well, it all depends on the level of soundproofing you need and your budget. If budget is not an issue, you can soundproof the entire car. Of course, this will demand more material. If your budget is limited, you can simply soundproof the main areas through which most noise is getting into your car. Whichever the case, ensure the doors, trunk and the floor are covered for the best sound damping. i. First, remove the door panel-To do this, you’ll need to detach everything holding the panel in place. Pry off any unscrewed components that may be hiding some screws. You can use a flat screwdriver to pry them off. Avoid using any force since a car door panel is designed to be removed with ease. You may take pictures as you detach different parts to make it easier when putting everything back. Use appropriate screwdrivers to remove the screws. Attach the screws on a magnet to avoid misplacing some of them. ii. Next, detach the door panel- Upon removing all the screws, you can now detach the panels. Some panels may come off easily while others need to be pried off. Lift the panel upwards and try to remove it. However, some designs may have different ways of removing the panel, but it should come off easily after unscrewing. Some panels may have a seal beneath them that acts as a protective seal. If your door has a seal, take it off. In case there’s an airbag beneath, don’t interfere with it. Just remove the seal to create enough room for the sound deadener. iii. Applying the noise deadener- Now that you have removed the panel, you can start installing the deadener on the door. But before you install the material, clean the car door. Use an appropriate cleaning agent such as rubbing alcohol and a rag to clean the door. Cleaning the door surface will remove any dirt and oil and allow the deadener material to adhere firmly. Once the surface is clean and dry, wear work gloves and cut the material to size. Take measurements of the door surface to mount the deadener to know the amount of material you’ll cut. Use a sharp utility knife to cut the material. When applying the material, start with the innermost sections and around holes. While some materials come with a self-adhesive, others would require the use of glue. With self-adhesive materials, you’ll simply peel off a protective layer to reveal the adhesive side. Once you apply the material, roll a roller on the material while applying some pressure to make it stick firmly. This will also remove air bubbles beneath the material. iv. Replace everything in place- Once done, put back the seal and panel. Screw the panel back in place the way you removed it. v. Repeat these steps for all the doors. i. It’s quite easy to insulate the floor from noise and heat. This is because there’s nothing much to take apart on the floor. You’ll only need to remove the floor carpet. If the carpet is glued in place, it might take you more time to remove it. If it’s held in place with some clips, it’ll be easier to take it off. ​​​​ii. Upon removing the carpet, you’ll need to clean the floor thoroughly. The floor is generally dirty and it’ll need extensive cleaning and vacuuming. iii. Next, you can start applying an appropriate noise deadener. Mats are best for proofing the floor against noise and heat. Most mats come in regular shapes and you can cut them to fit around shapes. If the mat is self-adhesive, you’ll just remove the adhesive protector layer and apply the material. Again, remember to press the mat firmly on the floor using a roller. Cover the entire floor for the best results. i. First, you need to prepare the roof for applying an insulator and sound deadener. Start with removing the cloth headliner on the roof. Be careful when removing the fabric since you’ll need to put it back in place after applying the insulator. The roof may not be dirty, but it will help cleaning it with rubbing alcohol. ii. Next, apply the sound deadener or insulator. Preferably use a fiberglass mat. It will insulate the roof against heat while still soundproof it. Remember that the roof may require thicker mats than other car areas. Thus, get a thick material for your car roof to get the best results. While applying the mat or layer of deadener sheet, remember to press it in place firmly using a roller. ​​​​i. First, remove any items you may have in the trunk like spare parts and assorted items. Just ensure the trunk is empty. ii. Remove any floor fabric or carpet in the trunk. iii. Clean the trunk- The trunk is the main storage area in any car. Basically, this is where you carry all manner of items in your car. Thus, it’s obvious that the trunk is one of the dirtiest areas of the car. You’ll need to clean it thoroughly using appropriate cleaning agents. Remove all the dirt and oil on the surface. This way, the deadener will adhere firmly on the surface. iv. Applying a sound deadening material- Preferably use mats or sheets for the trunk to cover large surfaces. You can also apply foam sprays for hard to reach areas where mats may not fit. Ensure to apply a thick layer of mat or foam to eliminate more noise in the trunk. Once done, apply the floor carpet or fabric back in place. i. Remove the fabric covering the rear deck. ii. Clean the surface deck with rubbing alcohol to remove any dirt. iii. Cut a sheet of a deadening material into shape and apply it on the entire deck surface. iv. Apply the fabric covering back on the dashboard and you’re done. First, you need to dismantle the dashboard to expose the firewall. This may prove to be a very challenging task. You’ll be working around electronic components, car gadgets and a lot of wiring. Before dismantling anything, remove the power cables from the battery. This will prevent electrical damage. Also, disable the airbags. Unfasten any screws on the glove compartment and pull it off the dashboard. Remove all the screws holding the dashboard in place.Once all the screws are removed, the dashboard will fall off easily. Next, remove the car stereo faceplate. Unfasten any brackets with a screwdriver. Unhook all wiring on the radio. Unhook all attachments and wires while taking pictures to help you in putting everything back. Once you’ve unhooked everything, the firewall will be exposed. ii. Clean the firewall- Next, clean the firewall to remove any dirt and grime. iii. Apply the deadener- Once the surface is clean, apply a sheet of deadener material on the firewall. Cover the entire firewall for the best results. While applying the material, cut out holes through which cables and attachments pass through. iv. Assembling- Assemble all components back in place and ensure all the cables are plugged to their rightful components. Finally, attach the dashboard back in place. In conclusion, installing automotive sound deadening material in your car is something you can do on your own. With the right tools, materials and time, you’ll surely add the material successfully. By doing it yourself, you’ll save more money. However, only use the best car sound deadening materials to get great results. Although it’s not possible to make your car fully soundproof, you’ll reduce a lot of noise by installing automotive noise deadeners. This will create great ambience in your car and enjoy listening to music in your car without vibrations and external noise.